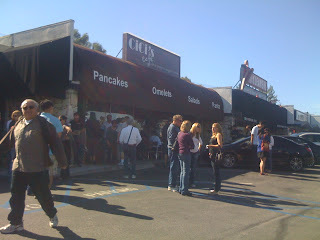 Located in the valley-Tarzana, CA on Ventura Blvd, this breakfast/brunch/lunch spot is always crackin’. ESPECIALLY on Sundays for brunch. As you can see from the picture above, there is usually always a wait for brunch on the weekends. Similar to “The Griddle” in Hollywood, Cici’s has huge portions and a ginormous menu. There is pages and pages of sweet and savory breakfast/lunch dishes to choose from, and everything is amazing on the menu. I LOVE this place! If you usually have a sweet tooth for breakfast, this place is perfect for pancakes, waffles, french toast or crepes. If you like eggs for breakfast, this place has incredible omelets, egg scrambles or eggs benedict. The menu is a little overwhelming because there is such a variety and so much to choose from, but it has something for everyone. They have a great lunch menu as well with salads, burgers, sandwiches and more. The Wacky Waffle. (Belgian waffle with Oreos, bananas, ice cream and whipped cream drizzled with chocolate syrup) Wacky Pancakes are bomb too! Cici’s Strawberry French Toast– w/ cinnamon & sugar. Classic french toast that is fluffy and perfect. It’s simple and the strawberries make the perfect addition. I love this spot for breakfast, portions are huge and menu has something for everyone. Your blog is awesome, Nice picks all around! Previous PostMASTRO’S STEAKHOUSE- MY FAVORITE!